How has the way we die and grieve changed? This talk takes the listener on a 1.5-million-year journey into our origins and shows how the dying and grieving experience has been molded by the great economies of human history—from hunter-gather to agrarian to urban to modern societies. Although there are thousands of death customs, the way we die and grieve demonstrates only a small, although important, set of variations. We will examine changes in life expectancy, causes of death, cultural customs, and folkways as well as the effects of urbanization and wealth on how we die. 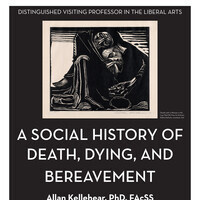 An historical look at our experiences facing death shows our current strengths and weaknesses in developing systems of support at these crucial times. The University of Minnesota Morris Distinguished Visiting Professorship in theLiberal Arts was established through the generous support of a private donor. I second that question - was it filmed? I would love to see it, but couldn't make it to the event! is this event going to be filmed or broadcasted? thank you!